A site guestbook is here. Test. As I have said before in these pages, images related to the Volturno disaster are not easy to find. But we are now up to page 4, so we are surely making progress. The first three image pages are here. i.e. pages 27, 28 & 29. And there are lots more images scattered throughout the entire site, also. To my amazement, Google re a Volturno image search, in Feb. 2006 listed 180 of them! This, the fourth page, has just seven images at this moment. But hopefully more images will yet be located in the future. I do hope that it is acceptable to show the next item in these non-profit & informational pages. als 100 Auswanderer in den st�rmischen Wellen umkamen. 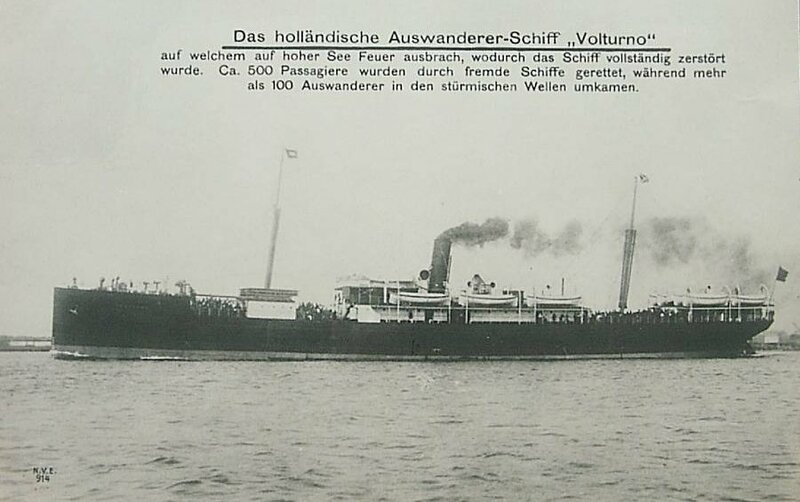 The Dutch emigrant ship "Volturno"
passengers were saved by a fleet of ships, while more than 100 emigrants died in the stormy waves. From a WWW source which today (Feb.2008) is unknown. I thought that I knew where it came from but (if my memory is correct) it is no longer there today. 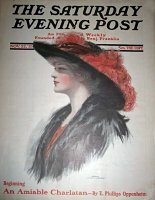 In Nov. 1913, specifically it its issue dated Nov. 22, 1913, 'The Saturday Evening Post', (cover at left) published a Grinnell Automatic Sprinkler System advertisement that featured a small engraving of the burning Volturno. A modest item perhaps but an item I have long sought for these pages. Now, thanks to the kindness of Jeff Woods of Arizona, I can show you the image. The reference to 38 years seems to relate to when General Fire Extinguisher Co. of Providence, Rhode Island, commenced its Grinnell Automatic Sprinkler System, presumably then in 1875. A pretty little image, I think. 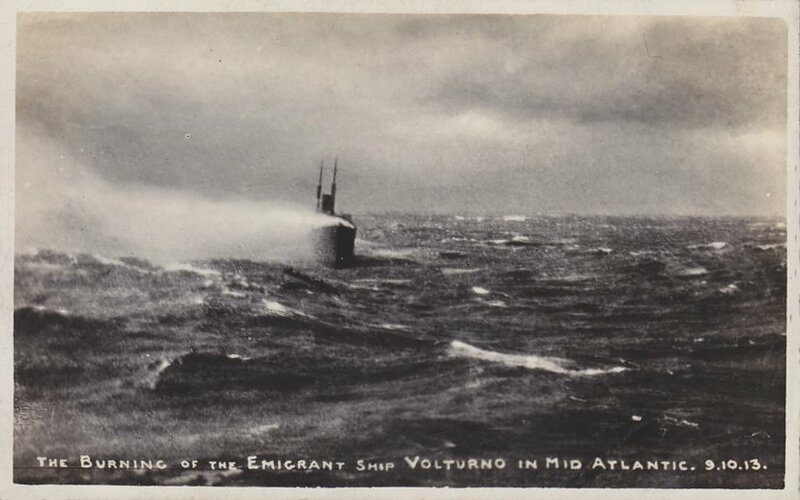 A most unusual postcard indeed of the burning Volturno abandoned & drifting in mid-Atlantic. No detail is available as to who published the card nor exactly when. The image has been kindly provided by Charles Dragonette, of Alexandria, Virginia. Charles has also provided the text that follows, which may be a reasonable translation of the German, which I also provide. This is the first reference the webmaster has seen to the Pretoria. I am puzzled at the time stated i.e. 6:20 a.m. on Oct. 11, 1913. At that time the rescue fleet was still at work. 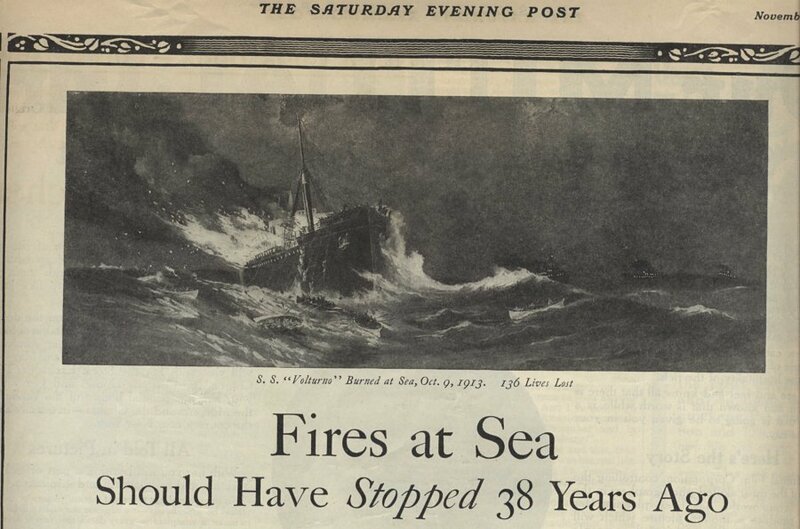 Perhaps the photograph was in fact taken at 6:20 that evening when the rescue fleet was long gone, or maybe at 6:20 a.m. the next morning i.e. Oct. 12, 1913. The latter date & time seems to be the more likely. But the card does say what it says & that I cannot change. A print from a 1919 publication. But which particular publication I cannot tell you. 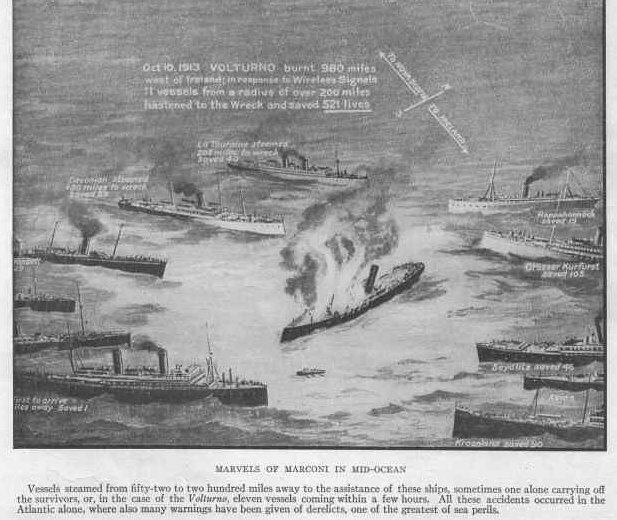 It would seem to relate to the success of Marconi's 'wireless' in saving life at sea since the print is entitled entitled 'MARVELS OF MARCONI IN MID-OCEAN'. The complete image is available here. If you could help pinpoint the source, your help would be much appreciated. The item is 7 x 10 inches with border, a border that is incidentally wider than what I show below. It would appear to be a reprint of a portion of what was published in 'The Graphic' in the issue of Oct. 25, 1913, & visible, first image, on site page 28. It is amazing what imagery has emerged over the years since this site was commenced about the Volturno disaster. In Mar. 2008, a collection of press images were offered for sale on e-Bay. From the files of the 'San Francisco Examiner'. Included were the following two images (which I have cleaned up & cropped for better presentation here). Now I should advise that I have not sought the approval of the e-Bay vendor, 'sfxarchive', for the use of the images. And hope that their use on this non-profit & informational site will be considered to be in order. It is only fair to note, however, that the vendor's e-Bay store is available here, & you are invited to drop by! I have, however, been in touch with the purchaser of the items, who welcomes their inclusion. The e-Bay listings are long gone. The first image, had recorded on its rear the following words: A close view of the Steamer Volturno ablaze. 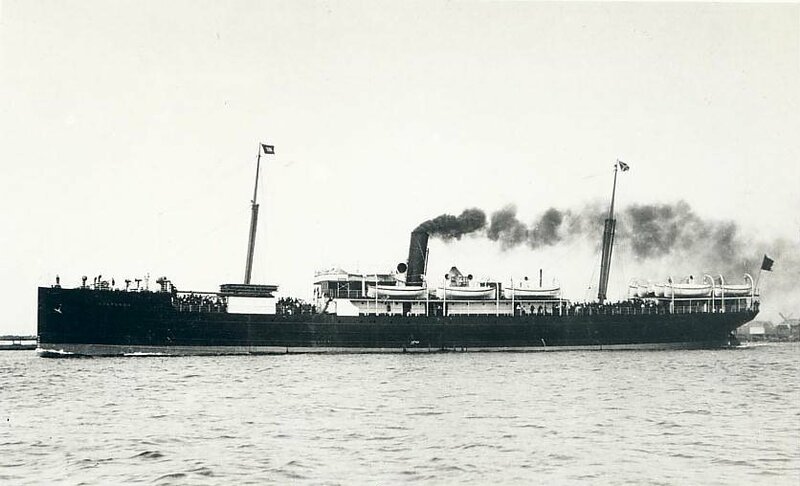 The photograph was taken from the deck of the Grosser Kurfuerst, as she, with the other rescuing liners, swung in close in an effort to take off the panic stricken passengers of the doomed steamer. 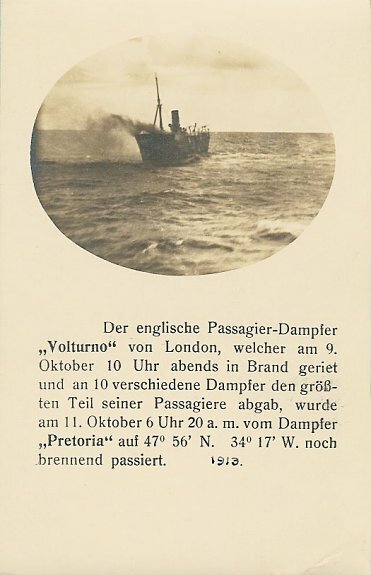 The second image, interesting particularly because it shows lifeboats right alongside the burning vessel, had on its rear, the following handwritten words: LINER "VOLTURNO" BURNS 10/11/13. I did not try to remove the crease across the image which removal would be surely beyond my modest image abilities, regardless! The work appeared as a print in the 'Chums' magazine issue dated May 9, 1914 (No. 1,130 Vol. XXII at page 628). I wrote those words after seeing the 1914 'Chums' magazine Annual in a Toronto, Canada, children's reference library. But other sources say it appeared in the Apr. 18, 1914 issue instead. I now have confirmation that my data is correct, & the print does appear as stated. But it is quite possible that the print was placed in the 1914 Annual in a different place than it was originally published. I will await further word from anyone who could clarify that situation? The original painting? That is a very different matter! I have no idea where it might be. But I do have some words re the original. I am now advised by John R. Bird, of Brixworth, Northampton, Northamptonshire, U.K., that under the print in the 1914 'Chums' Annual are the following words. John, I thank you! Reproduced from the picture presented to Arthur Spurgeon, J.P., by the British Press. 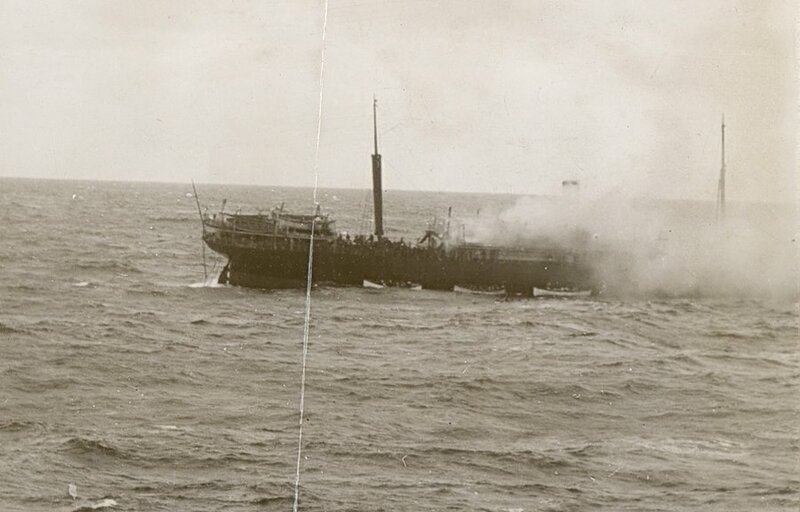 THE BURNING OF THE "VOLTURNO"
On the 9th of October, 1913, the steamship "Volturno," carrying 561 passengers, of whom 539 were steerage, caught fire in mid-Atlantic. She sent out wireless calls for help, which were answered by the Cunard liner "Carmania" and ten other vessels. The sea was so rough that these vessels could do nothing but "standby". 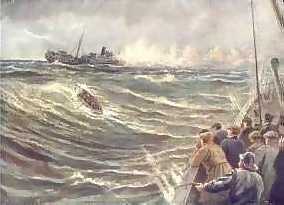 This picture represents the heroic attempt of one of the "Carmania's" boats to render aid. 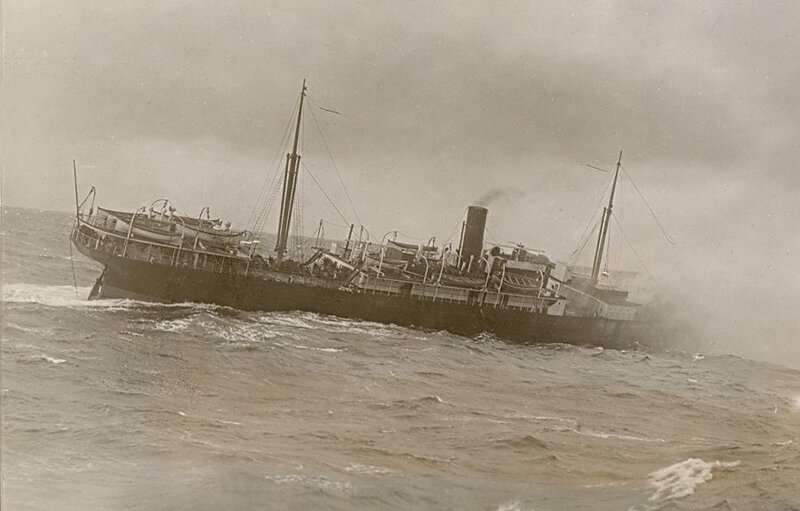 A feature of the disaster was the calm courage of Captain Inch, of the "Volturno". He left the burning vessel last, his dog in his arms. I am so pleased to have those words. Arthur Spurgeon, later Sir Arthur Spurgeon, was indeed, I understand, a Justice of the Peace. And here is a larger image of the work, kindly provided by John R. Bird. Now John has kindly provided me with three prints & the related negatives. It may just be possible, with those negatives, to be able to later improve upon the fine image I now can show you below. 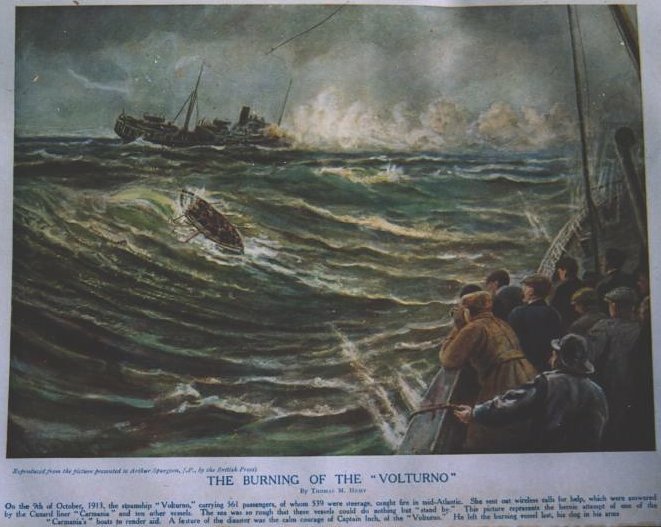 In Sep. 2010, a postcard image of the burning Volturno was sold via e-Bay. The first postcard of the burning vessel that I recall seeing. It sold for GBP 9.00 or approx U.S. 14.26 on Sep. 9, 2010.